Jevon Carter. WVU career steal leader (330). WVU single-season steal leader (112, 2018). WVU single-season assist leader (246, 2018). 4 time Big 12 All-Defensive Team. NABC Defensive Player of the Year (2018). Lefty Driesell Player of the Year (2018). Naismith Defensive Player of the Year (2018). 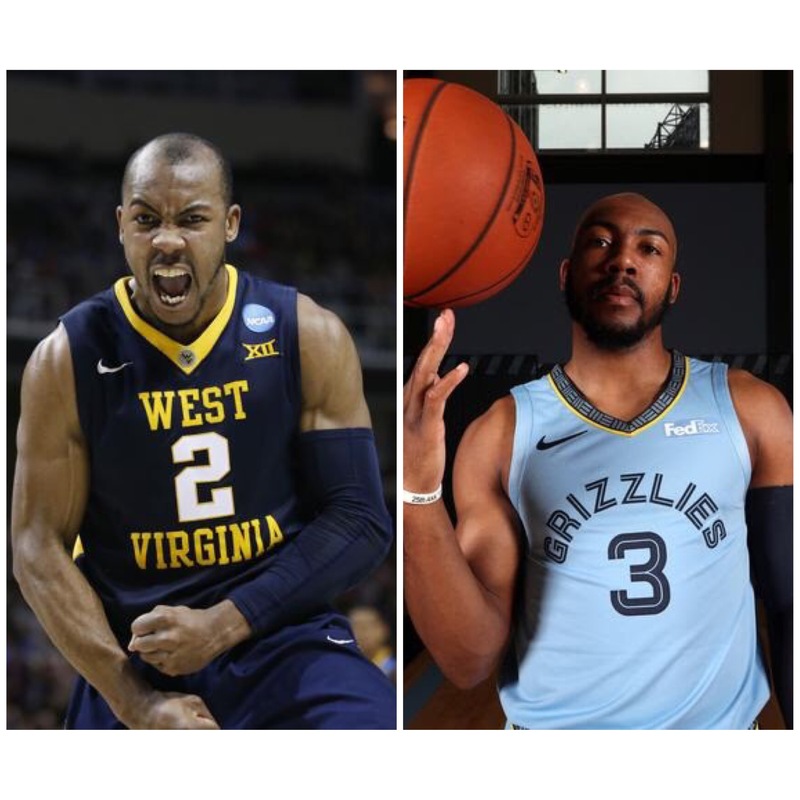 One of the best basketball players in West Virginia University history, Jevon Carter is now a rookie point guard for the Memphis Grizzlies. We recently sat down with Jevon to discuss his memories of WVU, what made him who he is, and the differences between his time in college and the NBA. Q: You are obviously beloved in the state of West Virginia. What the fans loved about you the most is your incredible work ethic. Where do you think that work ethic came from? JC: My background, my father, my family. I’ve been struggling and fighting my whole life to get everything that I have. Q: How do you get the modern player to buy into hard work when no one is watching? JC: I always had an inner drive and desire to be the best I could be. And so I motivate myself. I push myself. As far as a player that doesn’t want to work, I’m not sure you can really motivate someone that doesn’t really want to be great. Q: West Virginia is obviously having a down year this year. What do you think led to it and what would you tell the players if you were to talk to them? What can fix it? JC: I don’t know what’s led to it. I haven’t been watching them as much as I’d like to because of my season. I’m not there and I don’t know what’s going on inside the locker room or off the court, so it’s hard to say if you’re not there and you’re not a part of it. Q: Have you stayed in touch with your former teammates and Coach Huggins? JC: Sure, I talk to them as often as possible. Usually once or twice a month. Usually it’s not about basketball. It’s just catching up, seeing how everyone is doing. Q: What part did Coach Huggins have in your growth as a player and a person? JC: He played a major role. He helped me grow from the boy that I was coming out of high school to the man that I became in college. He just taught me a lot of the ins and outs of the game, how you have to approach it, and if I wanted to play professionally how I would have to change. Q: Do you have any plans to coach after your career is over? JC: Maybe one day. It’s not in my immediate plans right now, but you never know what could happen. Yeah, maybe one day. Q: What’s your greatest memory during your time at WVU? JC: Senior Night. Lots of great memories but Senior Night stands out. That was a great night. Q: What do you miss the most about Morgantown? JC: The people. The love, the fans, just the whole state, the whole vibe of just being there. Everybody looking up to you and rooting you on…in West Virginia, basketball and football means everything to the people there. Q: Some NBA questions. What’s surprised you most about the NBA? JC: The down time. How much free time you get. In college, your whole day was planned out for you. It’s not like that in the NBA. Q: How would you compare your coaches in the NBA to your coaches at WVU? JC: The coaches here, they’re more about you holding yourself accountable and getting things done on your own at your own time. They aren’t really strict about what you do and don’t do. You’ve just got to find what works for you and get it done. Q: Which NBA player has been the most difficult to defend? Q: Why is he so hard to guard? JC: You can’t touch him. Q: What advice do you have for young players that want to play in the NBA one day? JC: Don’t just play the game, try to understand it. Q: Do you see a lot of West Virginia fans in the stands at NBA games? JC: Yeah, I do. Almost every game, home or away. I love it. I love seeing the West Virginia fans showing love. 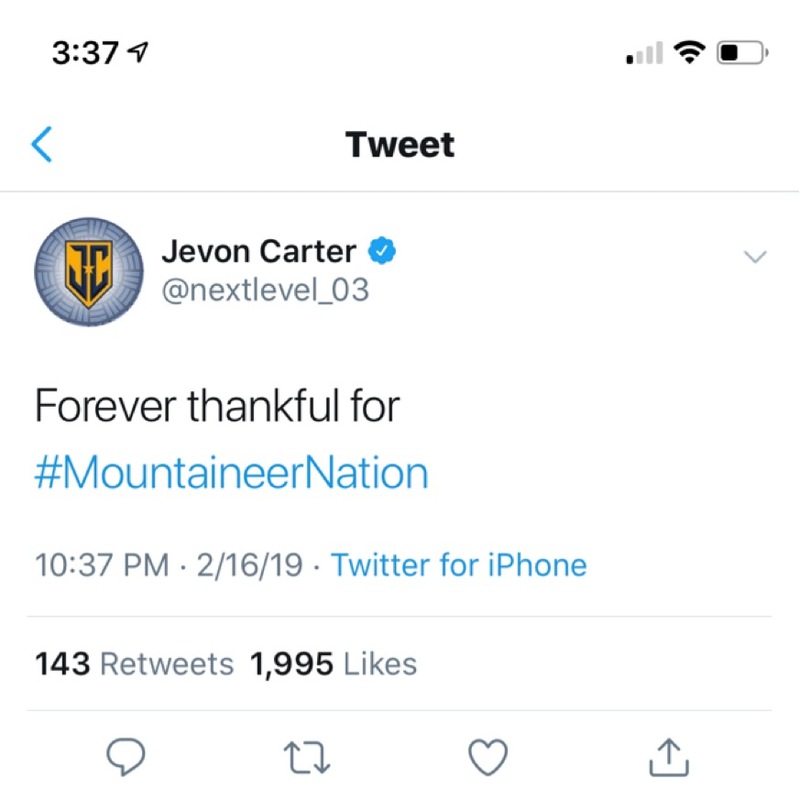 Q: If you could say anything to Mountaineer Nation, to the fans of WVU, what would you say to them? JC: I would just say thank you, thank you for everything. I truly appreciate the love and support that I’ve been given over the past four years…five years because they’re still supporting me now during my journey in the NBA. Thank you.